Today we’d like to introduce you to Cindy Sullivan. Cindy, please share your story with us. How did you get to where you are today? I recently found my diary from my 13 year old self (let’s just say that was many many years ago). In it I wrote “I want to be an aerobics instructor when I grow up”. Ha! Instead, I climbed the corporate ladder, successful but with a lack of passion. Fitness remained a part of my life but in the back burner. It wasn’t until I turned 40 that I had the courage to leave a world that I was successful and good at, to truly do what I loved. I was filling in as a substitute fitness instructor for a 50 plus Total Body Strength class. The teacher was in her late 60s and in amazing shape. The class was filled with folks up to the age of 80 who were stronger and more dedicated than many people I knew in my 40s. They also had a genuine drive to live a healthy and active life. They were grateful and loved to socialize in the group setting. Their histories were so fascinating to me and I learned so much about the diverse population of Boston. I asked the teacher if I could follow her around to her Boston based classes. I found that Body Blast and Boot Camp classes I had been pursuing were doing more damage than good to our bodies as we age. The teacher became my mentor and I never looked back. In building my business I took the lessons I learned from my former life in marketing and PR and applied some to my new business venture. I truly enjoyed what I was as doing and it showed. Word spread in my neighborhood of Beacon Hill and Back Bay. Suddenly, I was in demand as a private trainer and group fitness instructor. Today I continue to learn from whomever I can, online has been a huge resource. I also have amazing friends in the industry including a Physical Therapist and Pilates instructor who has been in the business for over 30 years. They have been a huge resource and have given me invaluable information and guidance. The rest I’ve done on my own, building my logo, website, and ultimately brand in downtown Boston. Today I am Personal Trainer, Group Fitness Instructor and Senior Fitness Specialist helping people in their own fitness journey. I ultimately focused on a population that is often forgotten by the big gyms. A group I like to call the “Active Agers”. My goal is to empower clients to get in their best shape and feel good, regardless of their age, size or fitness level. My little girl dreams came true! Of course, the transition from the corporate world to a fitness business has not always been easy. There is the intimidation factor that I’m too old. How do I get started? Could I pass all the exams and certifications? Luckily for me I met a mentor early on who both guided and encouraged me to just go for it. I’ve been told I have a Type A personality and I want to be the best in everything I do. Sometimes that can be a blessing and a curse. I’ve found it to be exactly what I needed to start my own business, while at the same time enjoy the feeling that I’m really making a difference in people’s lives. One of my biggest challenges these days is managing my time and not taking on too many clients. As a motivator and instructor, being “on” all the time can sometime be exhausting physically AND mentally. 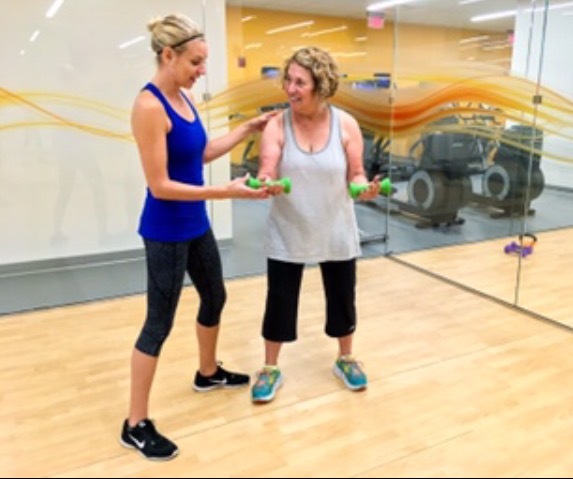 So, as you know, we’re impressed with Cindy Sullivan Fitness – tell our readers more, for example what you’re most proud of as a company and what sets you apart from others. My business is called Cindy Sullivan Fitness. I find it easier for my specific clientele to remember or find my name in this social media world. I specialize in Senior Fitness including strength, balance, stamina, flexibility and overall health. I believe everyone should have the opportunity to live a full, happy and long healthy life. I offer group classes and individualized personal training sessions in the comfort of their own home or location if their choice. I’m most proud of the fact that I truly love my clients and I think it shows. For example, one of my clients asked me to come to Nantucket for the summer to teach. As flattering and lovely as that sounded, I happen to have family in Beacon Hill who needed me 😉. Discussion continued and I ultimately ended up filming an Active Agers Fitness video, produced by Nantucket TV 18 in conjunction with the Saltmarsh Center and Elder Affairs. The DVD and links were reproduced and now available to purchase. The entire project was driven by my clients who believed in me and the work we do. I’ve also have people tell me I’ve changed their life! The testimonials I’ve received have brought tears to my eyes. If you’d like to check some out they are on my website www.cindysullivanfitness.com. My next step is growing the business! Demand is high and my future plans include taking on new trainers so we can reach more clients in Boston. Also, I recently returned from filming a second fitness video in Nantucket. I really enjoy being in front of the camera. Who knows where that could go?